We live most of our lives with a Girl Scout Cookie-shaped hole in our hearts, awaiting the time when it's socially acceptable again to consume an entire box of cookies in a single sitting. Praise be, that time is here again, and this time, we're cutting out the middleman and just drinking Thin Mints. 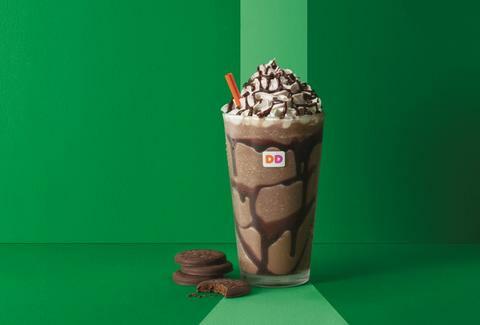 Dunkin' Donuts now has Girl Scout Cookies coffee. This inspired collaboration comes in three flavors: Thin Mints, Coconut Caramel, and Peanut Butter Cookie. 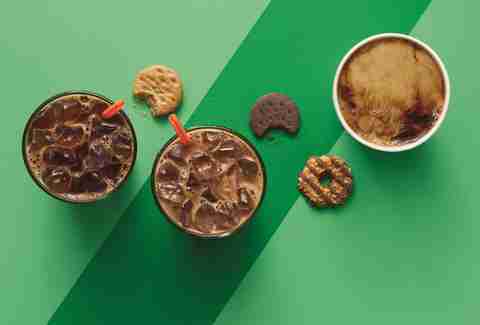 It's pretty obvious what a Thin Mint coffee will involve, but Coconut Caramel basically means Samoas, and Peanut Butter Cookie will be similar to Do-si-dos and Tagalongs. You can add these flavors to any hot, iced, or frozen coffees, lattes, macchiatos, and frozen chocolate drinks as of Monday, February 26. The coffee-coffee bacchanal will last until May, at which point these beverages will mercifully disappear before we start filling bathtubs with them. If you still want to support the next generation of female entrepreneurs because you're a good and reasonable person, Girl Scouts will be setting up shop in select Dunkin' locations, so you'll have the chance to purchase cookies directly from them as part of this partnership. It's a great opportunity to be a good person while eating a cookie, while drinking a cookie. And that's what being an adult is all about. James Chrisman is a News Writer at Thrillist who thinks you should buy some cookies from the Girl Scouts. Send news tips to news@thrillist.com and follow him on Twitter @james_chrisman2.